Made from Brass. Nice decorators item. In used condition. See photographs for details of any areas of wear etc. Miniature model - no weights. VINTAGE BRASS WEIGHING SCALE WEIGHT WITH OLD POUND SIGN. IN GOOD USED CONDITION. WEIGHS 356 GRMS OR 12,55OZS. IDEAL FOR LARGE DESKTOP PAPERWEIGHT. ITS BEEN USED AS A DOORSTOP FOR MANY YEARS. WITH LEAD INSERT STAMPED E,R, CROWN & NUMBERS. IN FAIR TO GOOD CONDITION. T ﻿ hanks for looking. Need it Quickly?. Item code: 4OC1510012C. ITS BEEN USED AS A DOORSTOP FOR MANY YEARS. WITH LEAD INSERT STAMPED G,R, CROWN & NUMBERS. IN FAIR TO GOOD CONDITION. .10gm,5gm,2gm and 1gm plus several tiny mg weights.20gms altogether.They are in very good condition and have tweezers to complete the set. 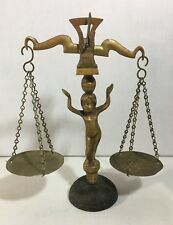 Vintage Very Large Brass Free Standing Scales ~ 18 3/4" High. Good Condition but could do with a clean/polish. Brass weights plus a small tub of varying flyweights. main brace screws into a brass holder fixed in the box and the scales simply balance on this. tweezers are supplied for this procedure. JUST NEED A GOOD POLISH. EVERY CARE IS TAKEN TO ENSURE THE ITEM REACHES YOU IN THE CONDITION IT IS DESCRIBED TO BE. ITS BEEN USED AS A DOORSTOP FOR MANY YEARS. WITH LEAD INSERT. IN FAIR TO GOOD CONDITION. WITH TWO BOWLS. DEEP BOWLS - HAVE ONLY BUFFED UP OUTER. BOWLS 11.5 CMS TOP DIA X 7CMS HIGH. HANGING ARM COUNTER BALANCE. HAS A HANGING HOOK AT TOP, VERY HANDY! AND FROM HOOK TO SWIVEL 19CMS HIGH. Vintage Brass 'scales of justice' with portable wooden case. Condition is Used. Dispatched with Royal Mail 2nd Class. VINTAGE BRASS SCALES ON WOODEN BASE 2 DEEP BOWLS COLUMN CENTRE & HOOK 18"
DEEP BOWLS - HAVE ONLY BUFFED UP OUTER. ELEGANT COLUMN LEADING DOWN TO CURVY STEM AND SOLID BASE. HAS A HANGING HOOK AT TOP, VERY HANDY! 12.5 CMS BASE X 46CMS HIGH X 36CMS MAX WIDTH INCL BASKETS. THESE OLD SCALES HAVE BEEN PAINTED BLACK BUT WILL POLISH UP. BRASS WEIGHTS ARE 1 x 1lb, 1 x 8oz, 1 x 4oz, 1 x 2oz, 1 x 1oz, 1 x 1/2oz, 1 x 1/4oz. IN GOOD CONDITION. New listingVINTAGE BRASS ROCKING CHAIR of 18.5CM HIGH ~ LARGE SCALE DOLLS HOUSE DOLL BEAR ? BRASS ROCKING CHAIR. Display for small doll or bear?. Seat width being 7.5cm. IDEAL DESKTOP MONEY PAPERWEIGHT. WITH LEAD INSERT STAMPED CROWN & NUMBERS. IN FAIR TO GOOD CONDITION. 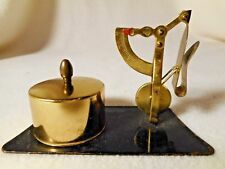 A center counter balance and two very small scales on either side make this only useful for a very general weigh of tiny things like jewelry or coins or just a rare little gem for a collector. HAS THE SCALES OF JUSTICE EMBOSSED IN THE CENTER OF THE LID. MADE IN INDIA. WEIGHS 7.1 ozs AS PICTURED. NO DINGS, DENTS, CRACKS, OR REPAIRS. STATES AS OF THIS DAT ARE: MN, WA, IA, CT, NJ, AL, OK, & PA.
CANDEARTE PORTUGAL. wear and tear with age and use. wear and loss to finish, wear to piece noted. wonderfully detailed fish throughout piece. nice piece for display in your collection. It appears to work fine and is a nice collectible. Size is 5" long by 3" tall. There is a bit of wear to the brass and paint loss of the bottom edges of the base. Vintage Brass Decorative Scale in great condition. Estate find from WWII VET!!!! Such a beautiful piece of brass, in great shape. The pictures show any and all flaws, if any at all. I have a Salter's Spring Balance antiqu scale that weighs up to 200 lb. It is made of iron with a large engraved brass dial and brass & iron hand. It is fully functioning and in excellent condition for a piece of this age. Great decorative piece! Approximate weight and measurements 11 lb before packing 23.5" Tall 7.5" deep 18" wide with trays For shipping I will probably break it down. I want to wrap the base with lots of bubble wrap to prevent any further loss of plaster. I believe it will ship fine. Most likely the loss is due to moisture while cleaning? See photos for complete description including size. Feel free to ask any questions you may have prior to purchase. See store category auction on sale for more. Items are added daily and or weekly. W & T AVERY Ltd., is a British manufacturer of weighing machines. He perished on the TITANIC. They balance well. If they should ever get out of balance, most unlikely there is a box of ball bearings screwed under the small pan. Salters Vintage spring scales to weigh 30 pounds.